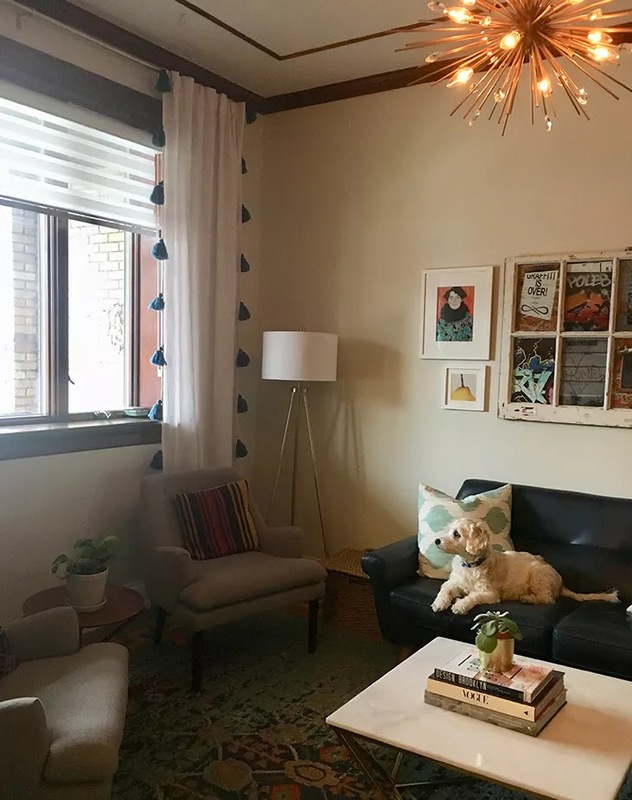 When we moved into our new home earlier this year, there was so much to love: high ceilings, original woodwork, a front porch perfect for sipping morning coffee before the kids get up. 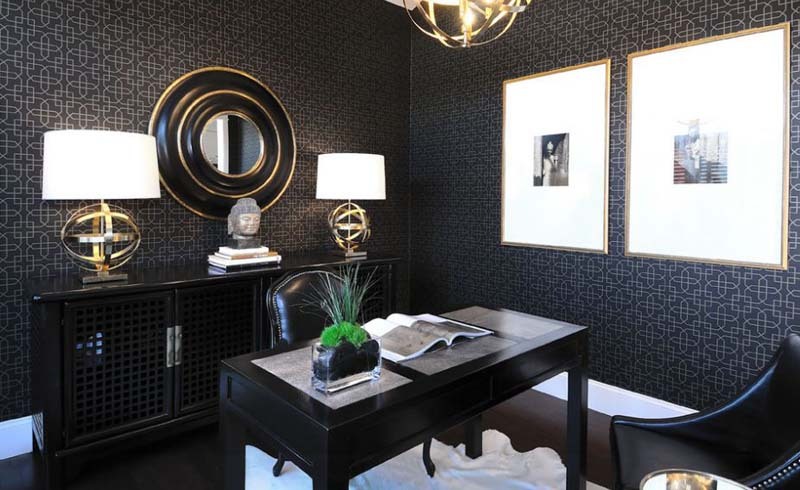 The one thing that didn’t match my dream home wishlist? It’s a narrow, south-facing row house on a tree-lined street, and it doesn’t get a ton of light. On top of that, the previous owners had left us with dark walls, heavy window treatments and an overall old-lady-who-never-goes-outside vibe. 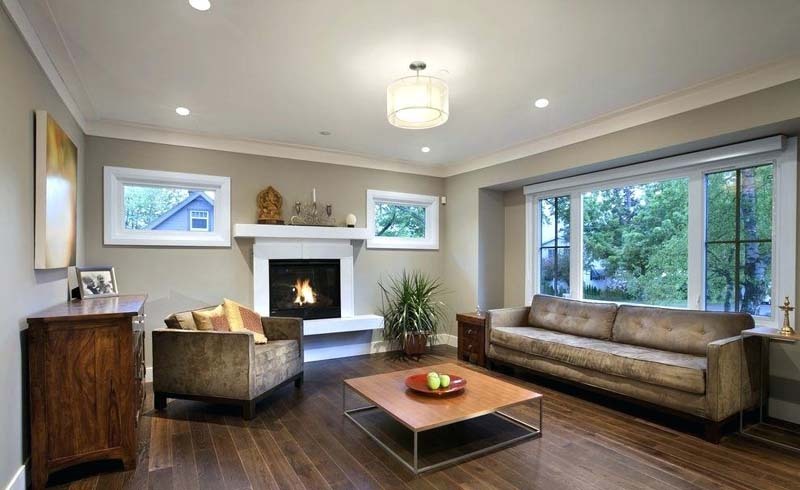 Simply moving in our furniture and rugs brightened things up, but the one-window living room was still bumming me out. So, with a budget of $1,000 we embarked on Operation Lighten Up. Here’s what we did. First things first. We had to get rid of that sickly tan. We wanted white, but didn’t want to go too stark, so opted for a warm “linen” tone. In retrospect, I wish we’d gone a hair whiter, but it did the job. With limited natural light, the overhead fixture had to do double duty: Produce lots of warm, bright light and feel visually sunny and luminous. 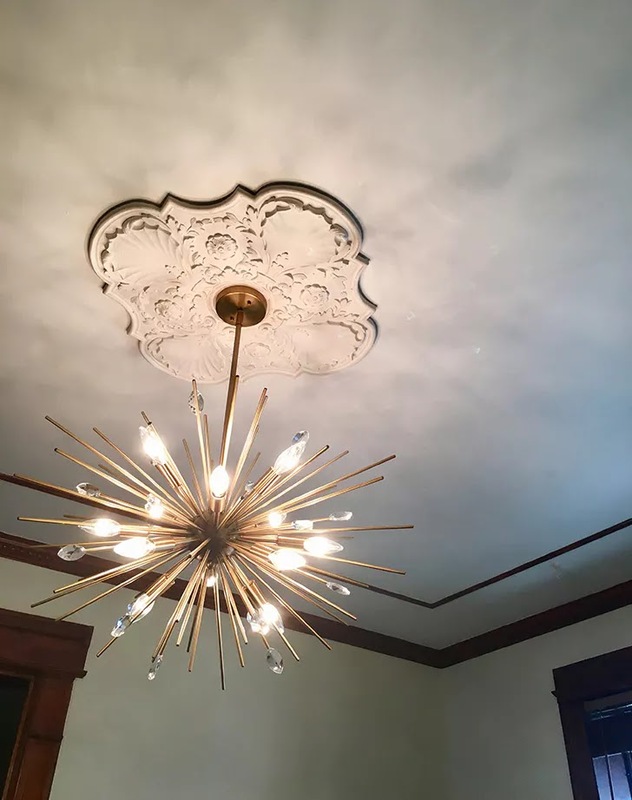 To match the gold in our coffee table and accent lamps, we replaced the heavy wooden ceiling fan with a 12-light Sputnik chandelier, which we put on a dimmer, so we could keep it soft during evening hours. The house’s arts and crafts era woodwork was a mixed blessing. On the one hand, it’s so awesome! On the other, it’s so dark! 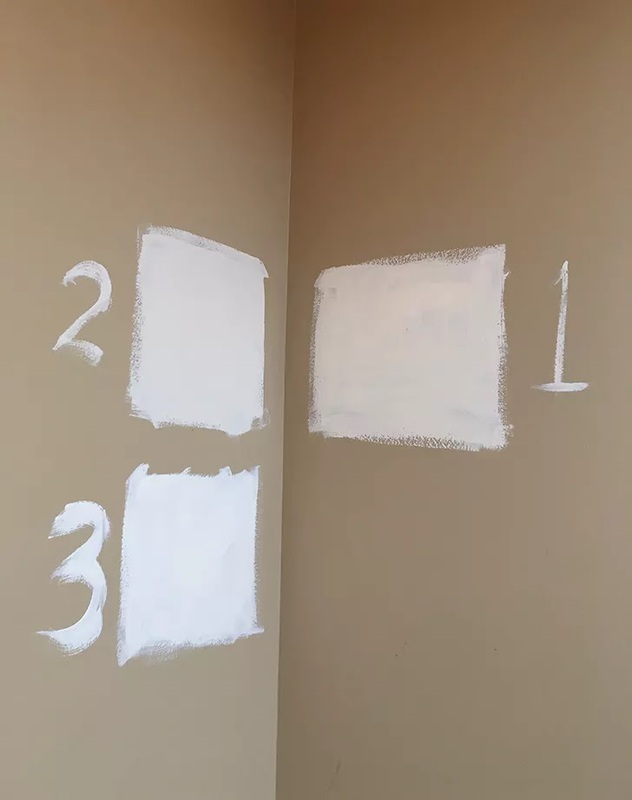 (For the record, I wanted to paint it white but my husband convinced me to keep the integrity of the original craftsmanship.) 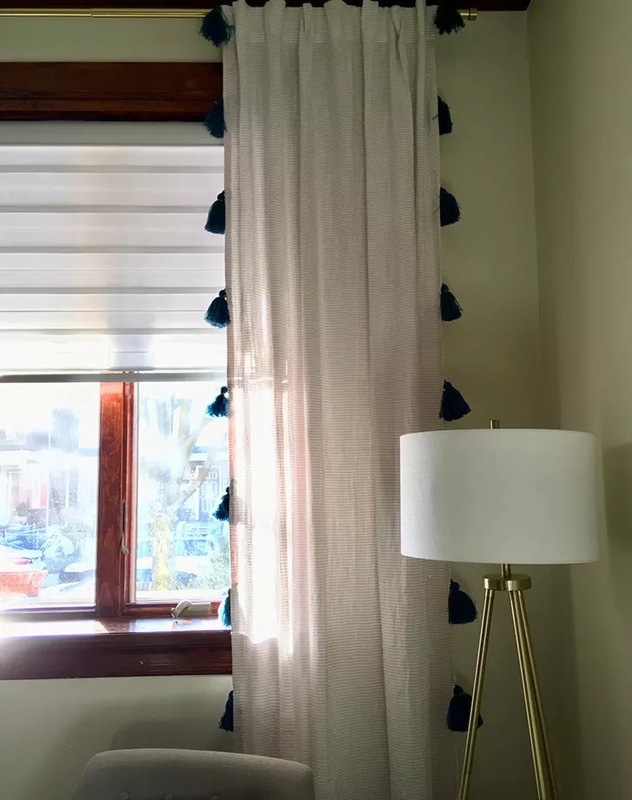 The solution: We replaced the slatted wooden blinds with a white and modern shade, then hung light-colored panel curtains high and outside the window frame, so they draw the eye upward and cover most of the brown wood. Pretty damn cheerful! And all for less than the cost of a new sofa.